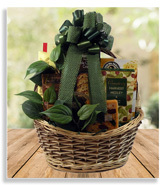 An excellent collection of well rounded Gourmet and Fruit Gift Baskets for all occasions. Loaded with Gourmet Snacks and Fruit, they are sure to be well received. Upscale presentation featuring a faux leather keepsake container. Perfect gift for any occasion. 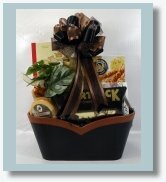 Elegant gourmet basket for all the important people in your life. For birthdays, corporate gifts and for expressing your heartfelt condolences. 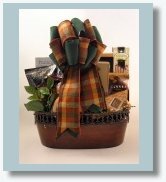 An upscale gourmet basket that exudes both class and elegance for personal and corporate gift giving. 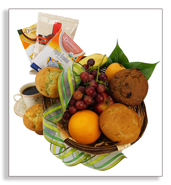 Healthy gluten free pick-me-up basket for the health conscious individual. 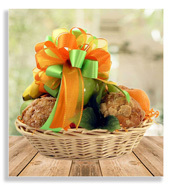 A delicious fresh fruit and muffin basket for personal and corporate gift giving. Send a care package to let someone know you are thinking of them, and to make their day a little easier. This fresh fruit basket is loaded with hand selected seasonal fruit. Several options to choose from. This versatile best seller has earned countless glowing reviews and received the highest recommendations from our customers. 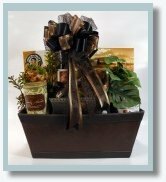 An elegant presentation with warm tones is perfect for any gift giving occasion. "Just wanted to let you know that your fruit basket was a big hit. I will certainly remember you in the future." Lynda M.